We receive inquiries for printer recommendations via email and LiveChat program quite often. Our friends and families also seek our professional opinions for advice when choosing a machine either for their home or small office. Here’s one recommendation for an excellent machine in a medium usage environment: – Ricoh multifunctional color printers. 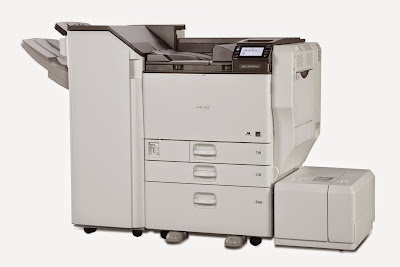 Some of the popular Ricoh models include the Aficio SP C320DN, Aficio SP C430DN, and Aficio SP C830DN/C831DN. All these models share common characteristics – low defect rate, excellent image output, and good page yield. This printer can print more than 42 pages per minute for both monochrome and color outputs. In addition, various media types are supported including brochures and booklets. The print quality comes with impressive 9,600 x 600 dpi with oil-free polyester polymerization cartridge design. The Ricoh Aficio SP C830DN and C831DN are equipped with a standard two 550-page paper trays and one 100-sheet bypass tray. Additional capacity can be added up to a 1,100 sheets tray or even a large 1,200-sheet side large capacity tray along with a 2,000-sheet large capacity tray. Handling heavy office print duties or creating professional documents in-house will not be an issue at all for these two printer models. Some of the energy friendly features including Eco Night Sensor and Eco-Friendly Indicator on the control panel display. Users not only can set the printer to energy conservation mode when not in operation, but also understand print history with its simulated impacts on the environment. The only common concern regarding the Ricoh Aficio SP C830DN and C831DN printers are the toner cartridges costs. 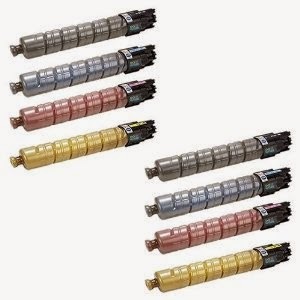 The OEM toner cartridges can cost up to more than $200 per color unit. Even though with its high capacity design, the hefty price tag on OEM toners still scares away many small business owners. Luckily, our excellent R&D team and group of technicians were able to remanufacture high quality compatible cartridges to save our customers a ton of money. Here at Toner Spot, we successfully developed high quality, re-manufactured SP C830DN and SP C831DN toner cartridges with just half of the OEM price tags while maintaining the print quality. To lower the risk switching to this model, our website offers 100% Satisfaction Guarantee Program for all orders along with professional supports on any printing related questions. There are also special discount programs for small business owners and educational institutions. Want to see what are your estimated printing costs? Email us at sales@toner-spot.com and our customer service team will contact you right away.